First Line: My polished-mahogany desktop was almost the way I'd left it earlier that Friday afternoon-- unmarred except for the computer terminal and its ancillary junk: the old leather-edged desk blotter, one black felt-tip pen, and an empty wooden in-and-out letter tray. Changes are coming to the Posadas County Sheriff's Office. Undersheriff Bill Gastner is planning his retirement. His Chief of Detectives is moving out of state. 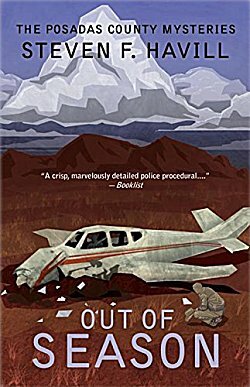 But the biggest and most shocking change of all comes when Gastner's boss, the sheriff, dies in the crash of a small private plane piloted by his brother-in-law. The first question on everyone's mind is why the sheriff was flying in such windy conditions to begin with. The man hated to fly. But that question is completely overshadowed by the coroner's findings: the pilot was killed by gun shots from the ground. Gastner has his work cut out for him. This is another sterling entry in Steven F. Havill's Posadas County mystery series. The author has put so much life into this fictional county in southwestern New Mexico that you'd swear it was real-- and if it were, I'd want to go for a visit. Out of Season covers a lot of ground. It shows us ranchers trying to survive when money is every bit as scarce as water but those bills still have to be paid. It shows us a tiny sheriff's department trying to subsist on a shoestring budget at a time when employees are getting good job offers from law enforcement agencies with a lot more money-- and now the death of the sheriff is going to have a profound impact on everyone there. Of course, life would not be complete without a bit of meddling from members of the City Council. The only quibble I have with Out of Season is that the story relied too much on the technical aspects and not enough on the characters, but that's not about to stop me from reading the next installment. Bring it on! You have me with the setting for this one, Cathy! It sounds like a series with a terrific sense of place, and I'm glad you enjoy it. It does have a terrific sense of place, and I'd love to treat Gastner to a meal at his favorite restaurant in town!